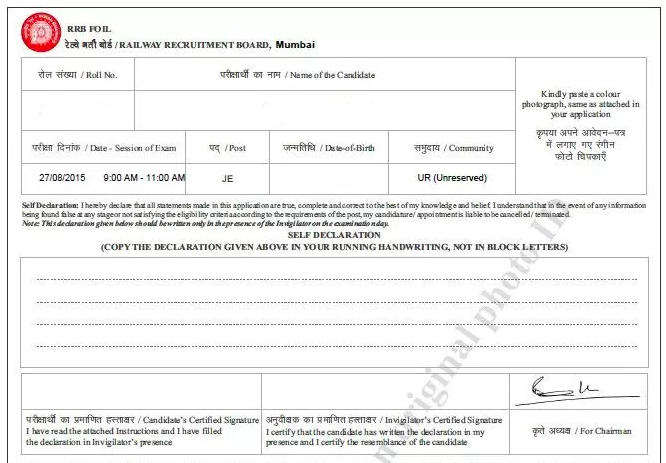 RRB Mumbai ALP CBT 2 Admit Card 2019 | Railway Recruitment Board of Mumbai has declared the examination dates for RRB ALP CBT 2 along with the CBT 1 Result announcement. The examinations are starting from 21st January 2019. To appear for exams, the candidates will require RRB Mumbai ALP Technician Hall Ticket 2018 -19. As already mentioned many times, RRB Mumbai Technician Admit Card for CBT 2 is important for the candidates appearing in the examination. In the article, you can read in detail about how to download the RRB Mumbai ALP Admit Card 2019 and other important details. 04/02/2019 Latest Update: RRB ALP CBT 2 Rescheduled Exam Dates have been released. The exam will be conducted on 8th February 2019. Read the notice below. Visit the official website of RRB Mumbai to download Admit Card and intimation of Exam City. Only candidates whose exams were cancelled will be able to appear in this retest. 29/01/2019 Latest Update: RRB Mumbai ALP CBT 2 Exam for 21st & 23rd January Re-Scheduled for various shift. 17/01/2019 Latest Update: RRB Mumbai ALP CBT 2 Admit card has been released on the official website. The candidates can follow the link given below and download their RRB Mumbai Technician CBT 2 Hall Ticket 2019 through Candidate’s Login. 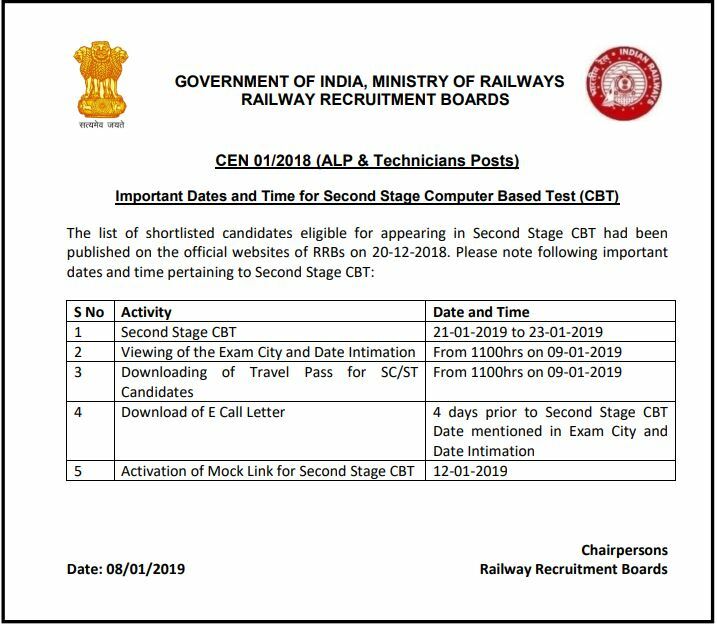 09/01/2019 Latest Update: RRB Mumbai ALP CBT 2 Exam Date and City has released on 09/01/2019 at 14:00 hours. RRB Mumbai ALP CBT 2 Admit Card 2018 -19 is expected to release from 17th January 2019. For the examinations to be conducted, RRB Mumbai ALP Admit Card 2018 -19 is the most important document to the candidates. The candidates will be appearing in batches for the examination. On 21st, 22nd, and 23rd January 2019, the examination will be conducted. Thus, it is expected that the RRB Mumbai ALP CBT 2 E – Call Letter will be available for download on the official website of RRB and the RRB Mumbai too. The candidates should remember in which regional RRB they have applied for the CBT 2 Examination as Admit Cards will be available on the respective Regional RRB website only. Along with Assistant Loco Pilot, Technician posts are also available for the recruitment process. The candidates are also appearing for the RRB Mumbai Technician CBT 2 Examination. Stage 2 Computer Based Test for the Technicians will also be organized on the same dates, from 21st January 2019 to 23rd January 2019. To appear successfully for the examination, it’s mandatory that applicants reach the exam hall on time along with the RRB Mumbai Technician CBT 2 Hall Ticket 2019. Though the procedure to download is the same, the candidates must remember the post and exam trade they have applied for. Following the basic procedure, we are providing you with the detailed process to download the RRB Mumbai ALP CBT 2 Hall Ticket. We will provide you with the link to download the RRB Mumbai Technician Admit Card 2018 -19. Still, if you are concerned you can always visit the official website and navigate your way to download the RRB Mumbai ALP CBT 2 Admit Card 2019. Follow the process below. Visit the official website of the RRB Mumbai. Or simply click on the links provided here. The candidate’s Login portal will open. Submit the Registration Number / Roll Number and Date of Birth along with Security Pin. The Admit Card will appear on the page. Check and Verify all the details mentioned on the RRB Mumbai ALP CBT 2 Admit Card 2019. If correct, download the hall ticket in PDF format. Print the admit card on an A4 size white paper preferably a colored copy. Keep 2-3 Xerox copies of the admit card for future references. Following details would be mentioned on RRB Mumbai ALP Technician Admit Card 2018 -19. Check all these details carefully. In case of a discrepancy please contact RRB Examination Authority and bring it to their notice that the Admit Card contains any kind of misinformation or incorrect details. 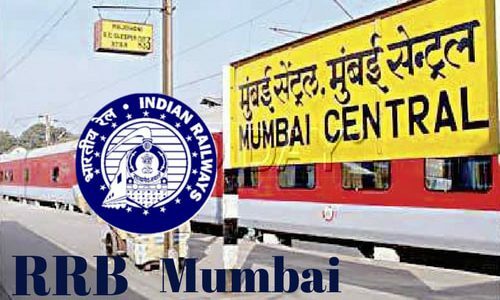 Railway Recruitment Board will release the RRB Mumbai ALP CBT 2 Exam Dates and Exam City before they release the RRB Mumbai ALP CBT 2 Admit Card 2018 -19. The Candidates would be able to visit the official website and check the RRB Mumbai ALP CBT 2 Exam City and Dates. The candidates would receive the RRB Mumbai ALP CBT 2 Exam City in accordance with their region of RRB. The candidates would be able to be prepared with their traveling and other means before the admit card is released or the examination commences. Though RRB Mumbai ALP CBT 2 Exam Center will only be mentioned with the exact Address on the candidate’s RRB Mumbai ALP CBT 2 Admit Card 2018 -19. Abohar, Amritsar, Banur, Barnala, Bhatinda, Fatehgarh, Sahib, Gurdaspur, Hoshiarpur, Jalandhar, Kapurthala, Khanna, Ludhiana, Malout, Moga, Mohali, Muktasar, Nawanshahr, Pathankot, Patiala, Phagwara, Ropar, Sangrur. RRB Mumbai Admit Card 2018: Railway Recruitment Board has released RRB Mumbai admit card to the candidates whose application has been accepted by the authorities. RRB Mumbai Hall Ticket will be issued 4 days before the date of the exam. Download your RRB Mumbai Group D Admit Card 2018 from this page by clicking on the link available below. RRB Mumbai Admit card is a must have to appear for an exam as it works as eligibility proof for the candidates who appear for an exam. In this article, we will discuss the way to obtain the admit card of RRB Mumbai 2018. RRB has released the Railway Group D Mock Test Link. Candidates can attend Free Online Group D Mock test here. Update (5.10.2018) – The Railway Recruitment Board has activated the link to check the RRB Group D Exam City/Center/Shift/Time for the candidates whose exam date has been scheduled from 16th to 26th October 2018. For candidates whose exam is scheduled after 26th October 2018, their link will be available on 18th October 2018. Update: The Link to Check the Exam City, Date, Time and SC/ST Travel Pass has been activated today (9.09.2018). The Link is available on all the Official Regional RRB Websites. The Link will stay activated from 14:00 Hours of 9th September 2018 for the candidates who have been scheduled for 17th September 2018 to 16th October 2018. The remaining candidates can Check the Exam City, Date, Time from 13th September 2018. The RRB has announced RRB Group D Mumbai exam date. The RRB has scheduled the CBT Group D exam from 17th September 2018. The RRB Group D Admit card will be available 04 days prior to the exam date. Candidates can easily download RRB Mumbai Admit card for Group D by logging in their registration number and password. Download RRB Group D Admit Card 2018 – HERE! Candidates those who have applied for RRB Group D Exam must be curious to know about the RRB Mumbai ALP Exam Date. Railway Recruitment Board Mumbai has finally released the First Stage CBT Exam date for RRB Mumbai 2018 for Group D. Check Exam Date for RRB Mumbai Group D Exam date & Also, Download RRB Mumbai Admit card 04 Days Before of Exam Date. RRB admit card/Hall Ticket is available only online to the candidates who are eligible and paid the required fee for the same. To check the eligibility for download RRB Mumbai Admit Card 2018, the candidates are first required to check the status of their application. In case your application gets accepted by the Railway Recruitment Board of that particular region. If your application is accepted by the recruitment board, then you can download your admit card from the given website. Also, note that RRB Mumbai does not send admit card via post or mail. Hence, if you are an eligible candidate you will have to download it online. Railway Recruitment Board, Mumbai is one of the regional recruitment boards of RRB. The board conducts an online test to recruit Assistant Station Master, Assistant Loco Pilot & Technicians, Group D, Goods Guards, Traffic Assistant, Commercial Apprentice, Lineman, and other security staff. The board also release notifications in the employment news and invites online application for the same and the eligible candidate’s will be provided with hall tickets to appear in the exam. 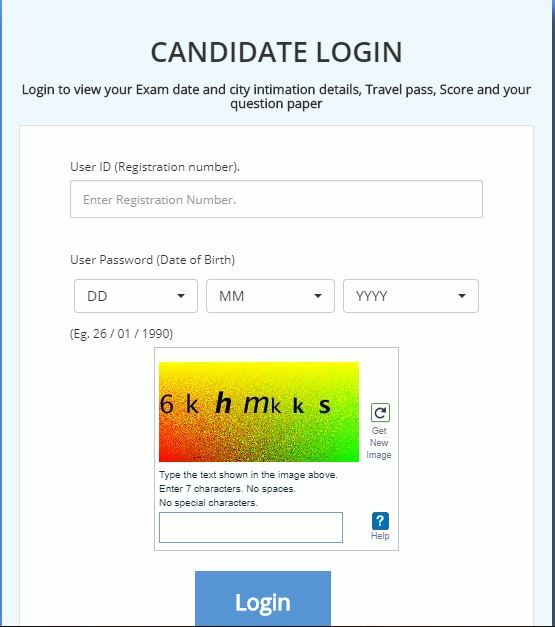 Now, your Railway Recruitment Board Online Exam Admit Card will be displayed on the computer screen. Also at times candidates are not able to download their Admit Card even if they have entered correct details, the hall tickets cannot be downloaded. In such case, the candidates should first check the status of their application. If the application has been approved by the Railway Recruitment Board, then wait for 2 – 3 days and then try again. If the problem still persists while downloading the RRB Mumbai Admit Card/Hall Ticket then you should contact the examination authority and tell them the whole story and provide proof of your application registration details. At the time of admission, on the day of the examination, the candidate will have to show the admit card and the details will be matched with your identity card. And if the details match you will be able to enter, otherwise you will be stopped before the examination hall. Hence, it is important to verify the details on the admit card, once you have downloaded it. Instruction to be followed by an exam. Hello, my name is Upasana Pradhan, I’m currently working as a Content Writer. I have done my Masters in Electronics and Communication from Delhi Technological University, Delhi. I always had a passion for writing. Apart from that, I love listening music, hanging out with friends, Cooking and Shopping. Sir mera hallticket nahi mil raha to meujhe apna roll number kaise milega? ? Exams over ho chuke hain. Abb admit card download krne ki link deactivate ho gyi h.
Check if your Admit Card is available. Appear for the exam on the date mentioned. If the date has crossed then Sorry to inform there is nothing that can be done. mera nam jitansra babaria hai. mere adkeka form maine march mahineme bhara tha. abhitak koibhi mesegge ya e-mail nahi aaya. kripaya muje bataye ki mere ladke ki railway mexam kabhi hogi please. I belongs to sc category I already downloaded my free travelling pass and it includes my starting location from which I have to start my journey but I want to know can I start my journey from any location which is near by me. we are alraedy prodide the link to check exam date and exam city in the article. Click on the link to check your railway group d exam date & city. for more plaese read the article properly. Mumbai k exam kab hai aur admit card kab milega.pls date batao sir pls…. SIR… HALL TICKET AANI ADMIT CARD FARK KAY AAHE….AND E-CALL LETER KAY AAHE. I have been trying to download my admit card but its not been seen. What am I suppose to do? I have checked the link, the application has been accepted but that does not take it through the admit card page. sir, mera pura tayari ho gaya hain lekin photo reuploaded ki baje se reject ho gaya.please, mera railway department vinanti hain ki rejected form hue hain vo accepct kare. main kahi salo se eska rah dekhata aa raha haun.sir hame na koi sms na email aaya hain.lekin keval photo reuploaded ki baje reject ye kaha ka nyay hain.please sir main dipression me haun muze kuch samzme nahi aa ra hain. exam ke pahile hi hame bahar vo bhi kisi notification na ho ne ke karan. RRB Group D k liye Photo re-upload ka link open kiya gaya tha fir sr. Apko Apni photo change krke re-upload karni chahiye thi. RRB will soon release the admit card for RRB group d exam. Group d admit card abhi release ni kiya gya hai. RRB ALP ka admit card release ho chuka hai. Apke exam date ke 4 din pehle Admit card download kar sakte ho aap. RRB Group d admit card is not released yet officialy. Here showing that according to alphabet my exam will be at 12august but there is no option to download hall ticket. Kya Aapne RRB ALp k liye apply kiya hai? Kyuki Abhi Sirf RRB ALP ka hall tickwt aya hua hai. Aur ALP Candidates ka Registration Number only 9 digit ka hai. I check in google of RRB admit card a difficult long so problem. Kindly confirm the date of Admit card generated & link. LOGIN LINK FOR CITY AND DATE INTIMATION AND SC/ST TRAVEL PASS…. plz tail me exam date sir for RRB ?????????????? student this fake people they want to just increase there views or clicks to get advt. WHEN THE GROUP D HALL TICKET TO COME & EXAM DATE. Please say us how to download admit card. we will provide the link for download RRB admit card for Group d and ALp exam immediate as RRB releases. Admit Card will be released 15 days before the exam. You don’t have to take stress for admit card. We will update immediately as soon as RRB releases. How to check my R.No.2480888200. MUMBAI DIVISION ADMIT CARD WHEN WILL BE OUT. Mumbai ka exam kab hai aur admit card kab milega . Admit card konse website se download karna hai . RRB Jaldi hi admit card release karegi. Hum admit card download link provide karayenge. Mumbai k exam date kab hai aur admit card kab milega.pls date batao sir pls…. sir group d ka exam kab ho ga.
Group D rrb exam admit card nd exam ?